Collection of three deep blue striped linen ticking pillows. The backings are in dark blue cotton linen fabric. The inserts are down and feather fill. The condition is very good with minor fade. Blue and white cotton linen pillows with white cotton linen backings. The condition is pristine. 19th century blue and white homespun linen pillows. Measure: Two pairs of 20 x 20 and two pairs of 22 x 22. Sold as pairs. 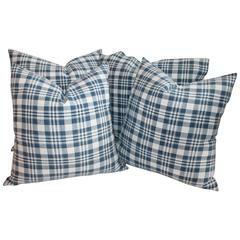 19th century homespun linen fabric pillows in indigo blue and white. There are pairs of 20 x 20 and pairs of 22 x 22. Two pairs of each. 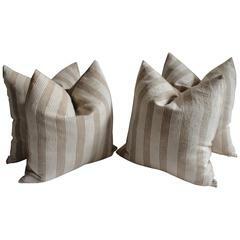 These fine striped home spun linen pillows are sold in pairs or all four as a collection. The backing is a cream cotton linen. 795.00 pair / 1395.00 for the four. All in fine condition.